Tessa Scott: Moments. This is one. This right here, right now, is definitely a moment. Tessa Scott: Anything could happen next. Published by Tonic Music Ltd. / Bucks Music Group Ltd.
Likely too many potential viewers will see this exquisite little film as just another Bucket List movie, but nothing could be further from the truth. Adapted by Director/Screenwriter Ol Parker form Jenny Downham's novel 'Before I Die', the film deals with delicate issues in a mature way and allows the emotional aspect of the film's theme to soar into that realm of films that deal with death in an honest and respectful way. Tessa Scott (Dakota Fanning in a miraculous performance with a perfect British accent!) is diagnosed with leukemia. Despite her four-year devotion to chemotherapy she has discovered that her cancer is terminal and her doctors don't give her very long to live. Tessa with the help of her best friend Zoey (Kaya Scodelario) comes up with a list of things she wants to do before she dies, including some risky behaviors that she deems necessary to have "lived". Tessa's dad (Paddy Considine) is resistant to Tessa's behavior from the start but realizes he has little influence and can only enjoy the time they have left. Best friend Zoey is excited and supportive of the outrageous bucket list until an unplanned pregnancy test comes up positive. Tessa's parents are divorced and have very different views on her desire to experience the dangerous side of life before she passes. Her mother (Olivia Williams) simply cannot deal with the diagnosis and copes by distancing herself from Tessa's activities and is more or less absentee in her role as a mother. Her father's main mechanism for coping is denial. Tessa mentions that he spends hours on the computer looking up possible treatments for her even after the doctors have told her that the cancer has consumed her body. Tessa's little brother Cal (Edgar Canham) is a brutally honest individual that has mixed feelings ranging from lack of care to jealousy to sadness. In the beginning of the novel Cal says to his sister "I'm gonna miss you" during a joking situation. One of Tessa's last wishes is to find love, of which she thinks she has with her neighbor Adam (Jeremy Irvine whose performance here is as fine as his War Horse role). Adam is shy and his main priority is taking care of his sickly mother after their father died. But Tessa's gradually breaks through Adam's fears and the two fall in love, Adam promising to stay with Tessa until the end. The film follows her last few months of life, explores her relationships with her loved ones, and her personal feelings about being trapped in a failing body. The film is tenderly brought to a credible and touching close - everyone has grown to appreciate that 'now is good'. 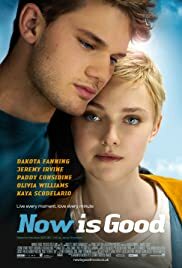 Dakota Fanning rises to new heights in her sensitive portrayal and her skills are matched by inimitable performances by Paddy Considine, Olivia Williams, Jeremy Irvine, Kaya Scodelario and a superb supporting cast. This is a very beautiful film that begs to be seen and understood. Never sanguine, it is just an honest piece of life - and death.